After our movie night out, me & WL headed out of One Utama for dinner. We came across this website which mentioned about Porto Romano which serves Italian-Mediterranean dishes in the heart of TTDI. We decided to try it out since the restaurants & cafes in One Utama no longer appeal to us. Both of us were not familiar with the location & depended on WL's car GPS to lead us there. However, the GPS directed us to a house instead of the restaurant which left us puzzled. One call to the restaurant to confirm that we were actually close by but have ventured to the housing area. We should instead head back to the old IBM plaza area. 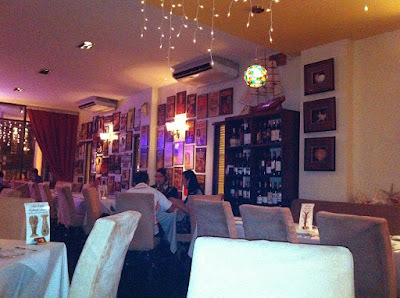 Stepping into the restaurant on a first impression was a pretty cosy & intimate ambience despite its rather small premise. Nevertheless, we didn't order much from the menu cuz we were pretty stuffed from munching McD nuggets while watching Kungfu Panda 2 earlier. More on that later in the next post. Therefore, we called for 2 dishes only - Porto Romano Spaghetti (house specialty) & Calzone (half moon pizza). 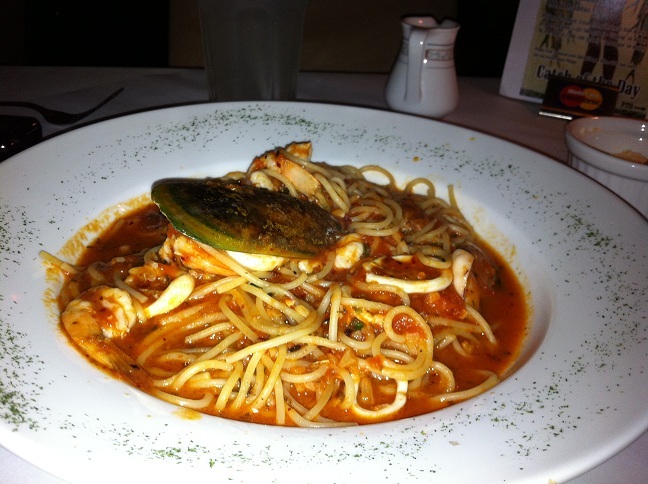 The first dish was pasta which consist of shrimps, squid & mussels. 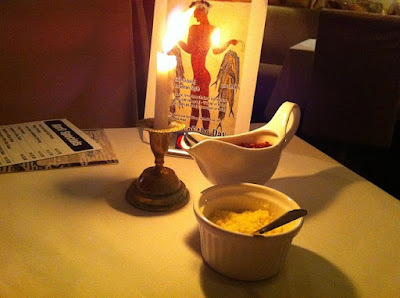 The presentation wasn't very neat & the abundance of sauce soaking up the pasta led to questionable taste. ...we were intrigued. It's half the size of one pizza folded into half with stuffings in it. On 2nd look at the crust, it didn't look mouth-watering cuz the surface just seemed too dry. 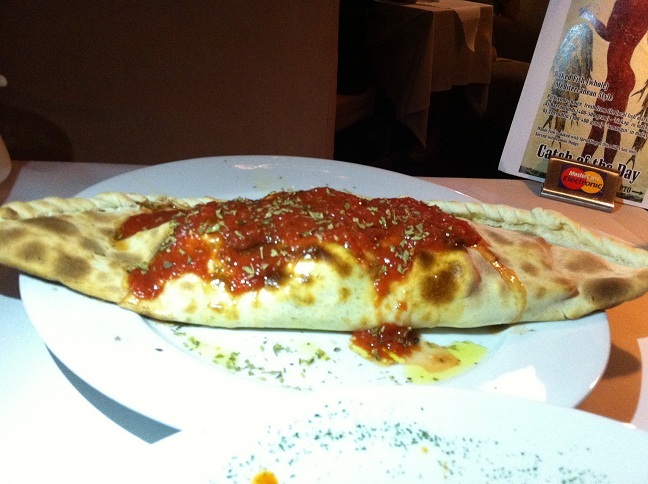 If you're wondering what's on the inside, it contain turkey ham, cheese & wild mushrooms. One bite of the half moon pizza didn't give us much excitement as compared to the pasta. It could be due to the weird taste from the ham or the crust lacked moisture that spoilt the entire dish. The price range is pretty normal when compared to other Italian dining but it wasn't worth it for us cuz we were left dissatisfied. I mean, food's worthiness very much depends on how much it can provide us pleasure while charged at reasonable price.